Do you have what it takes to command a fleet of planes flying around the world and keep all your passengers happy? 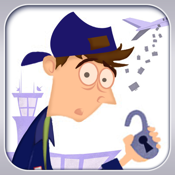 Test your skills in Now Boarding, a fantastic new game that challenges you to run an entire airline. Successfully deliver passengers to their correct destinations while managing a fleet of planes in this addictive game. Start in this eastern USA and expand to different regions as you work to shuffle passenger and planes around the world. Upgrade your planes with bigger engines and expand your fleet to make more money. More planes means more destinations and passengers. Manage the planes, keep your passengers happy and make even more money.